Did you know that there are more than 3,500 degree-granting colleges and universities in the United States? People from all over the world come to America to study in its fine institutions of higher learning -- 2-year and 4-year colleges and graduate schools offering programs of study in hundreds of disciplines. Getting admitted to some colleges is more difficult than admission to others. Therefore, finding information about colleges that match your unique abilities, needs, and interests is very important. Knowing something about the post-secondary options that are available to you will make your college search easier. First, you should think about the types of colleges that interest you. Are you looking for a public college or university? A private liberal arts college? A community college? A career college? A college with religious affiliation? A single-gender college? Some colleges reach out to you directly by sending you recruitment literature. However, if you only look at those colleges that contact you, you could be missing out on some great opportunities. 1. Do I want a 2-year or 4-year college? 2. Do I want a public or private institution? 3. What size college would be best for me? 4. Do I want to attend college in a city, in a suburban community or in a rural setting? 5. Would a single-gender college suit my needs? 6. Am I interested in a college that has a religious affiliation? 7. What do I think I would like to study in college? Once you have thought about these questions, its time to start your college search. 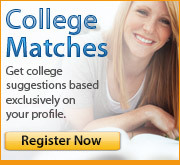 How can I find out which colleges meet my criteria? Get information about paying for college, how the admissions process works, writing college essays, campus visits, etc. You can also visit the college websites to take virtual tours, order admission materials, and learn more about the programs they offer. Once you form a list, meet with your guidance counselor to ask for an opinion and direction. Researching colleges takes time and effort. Look through their websites, paying particular attention to information describing admissions requirements, financial aid availability, academic programs and student life. Take notes and bookmark the sites you are interested in. Print any important pages and keep them with any other materials you may have collected from that college. If you decide that you don’t have any interest in a college, eliminate it from your list. There are many additional good sources of college information. You should meet with college admissions representatives who visit your school. You should also attend college fairs and college nights in your school and community, browse the college materials found in your school’s Guidance Office or College Resource Center, and talk to college students you know about the institutions they attend. Should I be looking only at the colleges I know my parents can afford? At this point, you should not be eliminating colleges or universities solely on the basis of price. Many of the most expensive schools in America have outstanding financial aid programs that make them affordable to a wide range of families. If your only concern about a school you like is cost, keep the college on your list. How will I know if I have done a good job of coming up with my final search list? All of these activities will provide you with insights that will help you develop a list of colleges that suit you. If you put some effort into this process, you will have developed a list of institutions that offer what you want and need from a college or university. You will probably have created a list of institutions to which you have a reasonable chance of being accepted for admission, as well.